During January–February 2010, a trial excavation was conducted in Ofer Park in Ramla (Permit No. A-5839; map ref. 186522–622/647892–8018), in the wake of discovering ancient remains during work that preceded the construction of a soccer field. The excavation, undertaken on behalf of the Israel Antiquities Authority and underwritten by the Ramla municipality, was directed by R. Toueg, with the assistance of A. Hajian and B. Antin (surveying and drafting), A. Peretz (field photography), N. Zak (final plan), Y. Kupershmidt (metallurgical laboratory) and D.T. Ariel (numismatics). Architectural remains were exposed in probe trenches dug at the site, on either side of a running track, just centimeters below the surface. A section of the running track (length c. 40 m) was dismantled in preparation of the excavation and six squares in a row were opened (1–6; Fig. 1).Building remains and numerous potsherds, mostly dating to the Abbasid period (ninth–beginning of tenth centuries CE) were exposed. The upper layer of soil in the area was hard hamra (L100–L105), which overlaid a layer of reddish clayey sand (L107–L111, L113); below it and at different depths in each square, was a layer of tamped greenish gray clay, devoid of finds. The architectural remains were built into the layer of clayey sand and their foundations were set on top of the tamped clay. An extensive excavation was conducted c. 100 m east of the current area in 1998; building remains, drainage systems, installations and a multitude of small finds were uncovered and ascribed to two main phases, the most important of which dated to the Abbasid period (ninth–tenth centuries CE). The findings from that excavation indicated the site was abandoned sometime in the eleventh century CE (‘Atiqot 49:57–99). Square 1. Two walls of a building (W202, W203; Fig. 2), whose foundation course was preserved, were exposed.Wall 202 (preserved length 1.5 m, width 0.6 m), aligned east–west, was built of two rows of medium-sized dressed limestone (0.2×0.4×0.6 m) on the exterior and the partly dressed small fieldstones on the interior. It seems that W202 delimited the building on the south. Wall 203 was oriented north–south and built of small fieldstones. Although the wall’s southern end was not preserved, it seems that the wall abutted W202 on the north. The excavation in the square yielded potsherds dating to the ninth–beginning of the tenth centuries CE. The two walls were set on a layer of tamped greenish gray clay. Square 2. Many potsherds dating to the Abbasid period (ninth–beginning of the tenth centuries CE) were discovered. Square 3. A wall (W201; preserved length 2.1 m, width 0.4 m), built of dressed limestone and preserved to the height of its foundation course, was exposed. The stones in the outer face of the wall were meticulously dressed, whereas those on the inside were coarsely dressed. The wall was set on tamped greenish gray clay. Square 4. A round cesspit (L112; Fig. 3), built of fieldstones in dry construction, was exposed. The upper part of the pit was damaged. The foundation of a drainage channel, built of gray lime-based mortar, was discerned in the northern side of the pit and led to it. The pit was built into a layer of reddish clayey sand (L108) and its foundation course was set on tamped greenish gray clay. Potsherds dating to the ninth–beginning of the tenth centuries CE were discovered in the excavation of the pit’s foundation trench (L114). Square 5. Many potsherds dating to the ninth–beginning of the tenth centuries CE were discovered. Square 6. A round cesspit (L106), built of dry fieldstone construction and preserved almost in its entirety, was exposed. 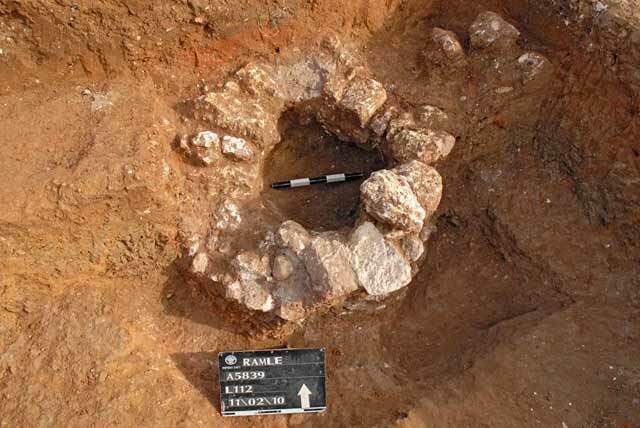 This pit was also built in a layer of reddish clayey sand (L107) and its foundation course was set on tamped clay. Potsherds dating to the ninth–beginning of the tenth centuries CE were discovered in and around the cesspit. The numerous ceramic finds included mostly domestic ware dating to the Abbasid period (ninth–beginning of the tenth centuries CE), among them bowls, kraters, cooking pots, jars, cups, juglets, and flasks, including Khirbat Mafjar ware. The pottery assemblage is very similar to the one discovered in the excavation to the east (‘Atiqot 49:63–82), and consequently the excavated architectural remains are undoubtedly connected to the building complex that had been uncovered in that excavation. The pottery finds also included a few fragments of vessels, mostly cups, dating to the Umayyad period (eighth century CE), as well as three potsherds dating to Iron Age II, which were discovered in the layer of clayey sand. 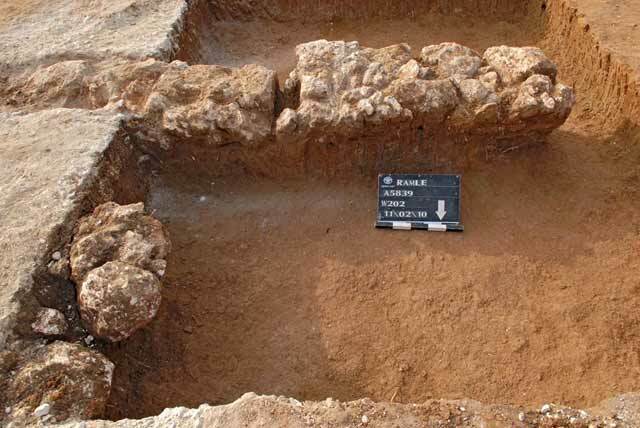 A few Iron Age potsherds were discovered without building remains in other excavations in Ramla. It is possible that the origin of these sherds is in the farmhouses that were situated in the agricultural hinterland of the city of Lod in the Iron Age. While excavating the surface in Square 4 (L103) an Umayyad fals (post reform; IAA 120962) dating to the first half of the eighth century CE was discovered. 2. Square 1, looking south. 3. Square 4, cesspit, looking north.